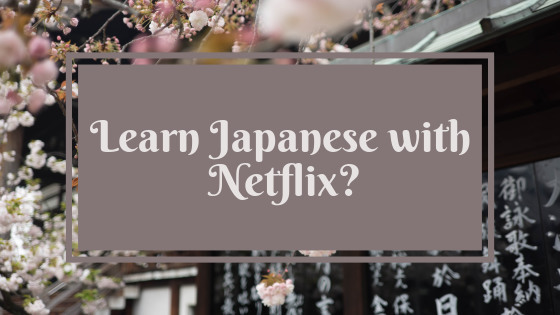 What if you could make your Netflix sessions more effective by learning Japanese at the same time? I’ve recently joined Netflix and it is turning out to be a pretty good resource for studying Japanese, even though I am not in Japan currently. It turns out that there are quite a few Japanese TV dramas, anime series and films available internationally, with the list of Japanese language content increasing every week – great news for language learners! How can Netflix be used for Japanese study? The Japanese content on Netflix is a good way of working on your Japanese comprehension, as you can choose whether to have the English language subtitles on or off. Changing the subtitles for shows on Netflix is simple: just look for the speech bubble icon in the bottom right corner of the play menu which will allow you to change the language of the subtitles displayed, or change the language of the show if there is more than one available. As you can see from the above, my Netflix is in Japanese, so the list of languages under 音声 (おんせい) refers to the audio language and 字幕(じまく) shows the language subtitle options. Setting your home country to Japan changes the language of the interface to Japanese, but also gives you access to a greater number of Western shows with Japanese subtitles too. The best ones to watch in terms of Japanese study are the Netflix originals (known as Netflixオリジナル作品) as you more often than not have the option to choose Japanese subtitles or Japanese closed caption (CC). You could watch a series that you already have watched in English and then rewatch with the Japanese subtitles. This helps you focus on how much of the language you can understand without looking anything up, as you are already familiar with the characters and story. The main advantage of using Japanese subtitles is that it will be much easier to pause and look up new words or phrases in the dictionary as and when you encounter them. Watch using Japanese subtitles only, or try watching without any subtitles to really test your listening comprehension skills. Whilst this seems the most difficult and scary to do, the nature of TV will help fill in a lot of the important context of what is happening. It is also the best way to get used to the language being spoken at a natural speed (rather than at a slow speed as it tends to be in most language study materials). Watch with dual subtitles. Chrome Extensions such as LLN: Language Learning with Netflix allow you to watch Netflix with two lots of subtitles. This gives you the opportunity to compare the two languages as you watch – the best of both worlds! There’s a lot more to be said about subtitles and language learning, which I decided to cover in a separate post. Whilst I don’t always watch things more than once, I find that rewatching a series allows you to more accurately identify what aspects of the language you need to focus on (ie. is it vocabulary that is hindering your comprehension or is it grammar?) as you do not need to pay attention to the storyline as much. If it is not vocabulary or grammar, then it is often your listening comprehension letting you down. What I find most useful about Netflix is that some videos can now be downloaded for offline viewing on the app which now makes it much easier to study on the go. The main downside with Netflix at the moment, however, is that there is not much in the way of variety: rom-com and food lovers, in particular, are likely to find something to enjoy here, but others may struggle. I hope that more Japanese language content is to be added in the future; fortunately, there has been a steady stream of new content over the last few months. Netflix will notify you when content that relates to your interests is added. One thing I’ve noticed which I hope will get fixed is that the subtitles are in white, which can be a bit tricky to see depending on the scene. I’ve compiled a list of Japanese language TV shows, films and anime that I’ve found on Netflix UK below (those that have options for Japanese/English or no language subtitles are given in brackets). I try to update this on a weekly basis! NB: this does not include content that has been dubbed into English (eg. Pokemon X & Y, Yugi-oh!). So is Netflix worth it for Japanese learners? At this stage, there is not quite enough content for me to recommend subscribing purely for learning Japanese (there appears to be a good selection of Korean and Taiwanese dramas compared to Japanese content), but if you already have a subscription I definitely recommend checking the Japanese language stuff out. Of the content I’ve watched, some of my favourites from the above list are Midnight Diner, My Little Lover and Jiro Dreams of Sushi. If you are interested in reading more about Japanese content on Netflix, check out this post where I write in greater depth about my top 8 TV shows, anime and films. However, my absolute favourite TV show on Netflix, especially in terms of learning about Japanese language and culture is ‘Japanese Style Originator’ as each episode focuses on different aspects of traditional Japanese culture. There are 54 episodes, some of which are up to 2 hours long so there is plenty to get your teeth stuck into! What would be your recommendation for something to watch on Netflix? Have I missed anything from the above list? Let me know in the comments!